0.22 inches was, indeed. how much rain fell in the form of drops from Nimbostratus clouds yesterday as a modest little rain band generated by a rapidly moving trough swept through during the afternoon. Regional precip values can be found here. Our local area got the most, up to about a quarter of an inch, as often happens in marginal storms. 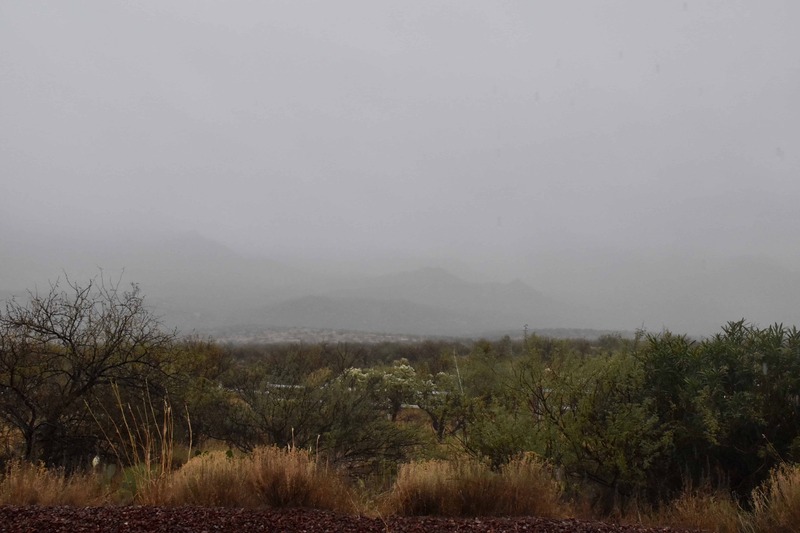 Yesterday’s storm marked the beginning of the new, more normal weather regime for southern Arizona, as has been blabbed about here in recent weeks. No more week after week of droughty weather with temperature far above normal, the kind of weather that has marked this whole fall and winter so far! I. e., “Thank you very much, a snowbird might say, but get the hell out!”, the rest of us might conjure up, thinking about the needs of our desert’s wildlife and vegetation. 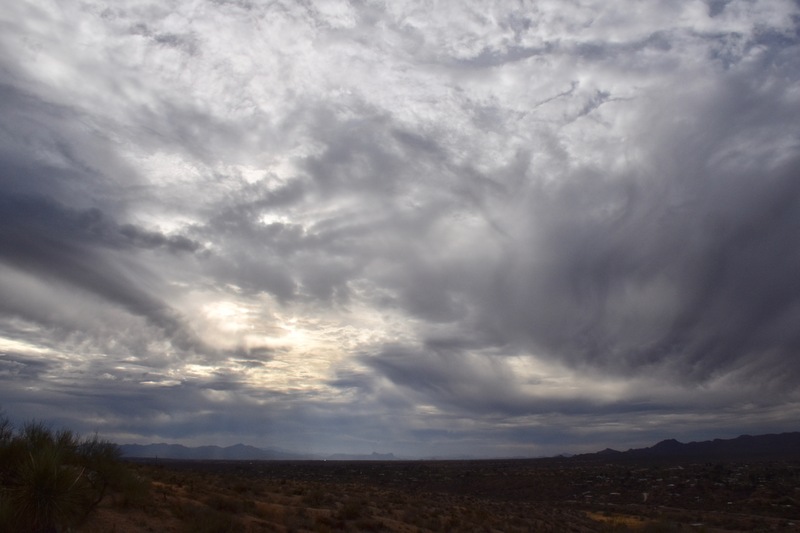 Indications are now that below normal temperatures and above normal precip are ahead for us and all of Arizona in late Jan and early February. The evidence for these claims? Below, the stunning, jaw-dropping evidence for this seemingly outlandish assertion in the form of an ensemble (spaghetti) plot generated by NOAA last night. I have followed these charts for almost ten years now, and I cannot remember when such a strong signal (clustering of flow lines) 15 days out has occurred before in our region. So, excessively excited this morning when I saw it! Its been annotated with excitement text. This troughy pattern begins to take place on January 30th. Until then, a strong but dry cold front with a lot of wind comes by in a few days, on the 25-26th. Valid at 5 PM AST, February 4th. You can pretty much count on a trough hereabouts in two weeks. Since the blue lines, the colder portion of the jet stream, do not dip down this way so much, our troughiness likely would be in the form of something we call a “cutoff low.” A full latitude trough extending from the “blue jet” up there in Canada, instead of a “cut off”, would be excessively cold. We probably don’t want that anyway. 7:24 AM. 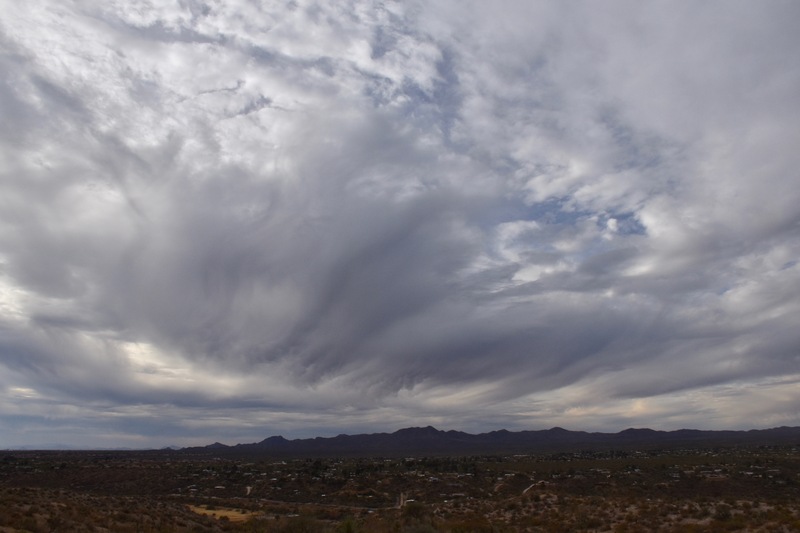 It was breezy already, and with Cirrus underlain by Altocumulus lenticularis clouds in the lee of the Catalina Mountains, you knew that a storm day was ahead without turning on your favorite TEEVEE weatherman. 8:53 AM. With Cirrus and Altocumulus spreading rapidly from the SSW, lenticulars downstream from the mountains, the wind gusting to 25-35 mph, you knew a great gray cloud day was in store! 11:32 AM. Before long, an entire sheet of Stratocumulus spread over the sky, making you sure that rain would fall. 12:50 PM. First drops begin to fall on Sutherland Heights. That layer of Stratocumulus appeared to be deepening as it approached from the SSW to where the tops were getting just cold enough upwind of us to produce ice and snow that melted into those sparse drops. Not enough ice /snow formed to hide the bases, though, in virga. 1:26 PM. 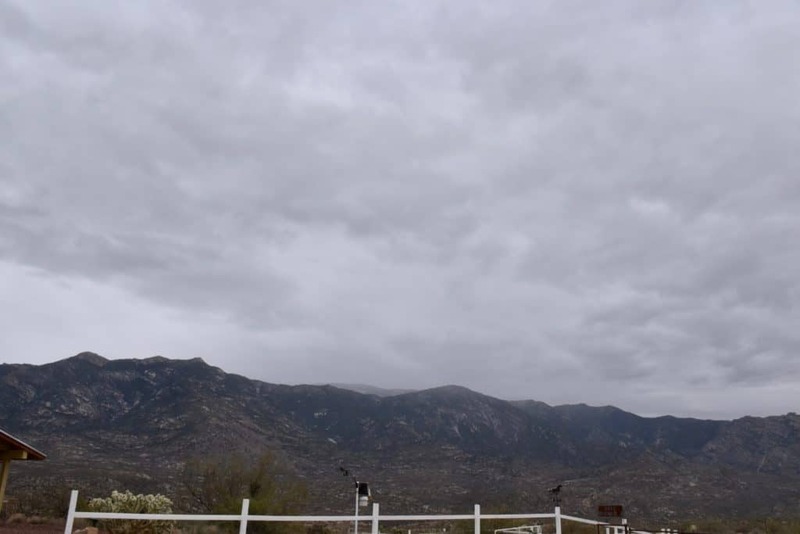 Snow begins to fall on the Lemmon. 2:04 PM. Lower Stratocumulus clouds begin to show up below the original deck that overran us. 3:16 PM. Pretty and dramatic. 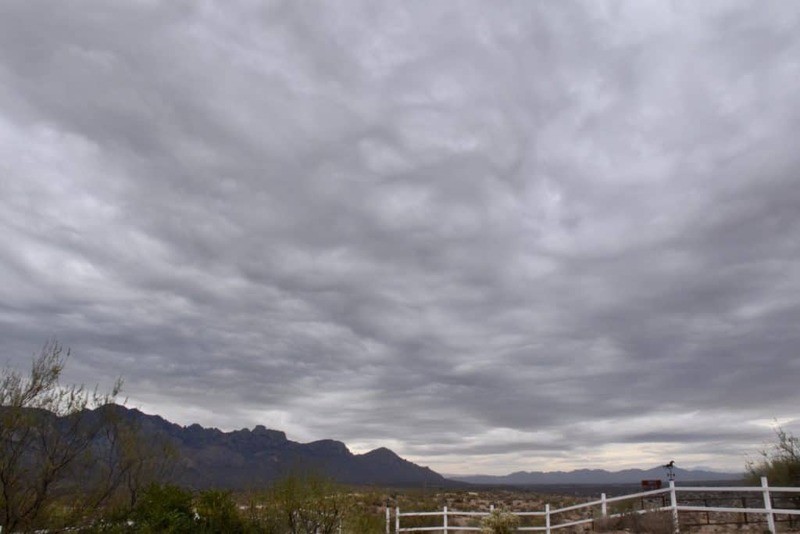 Stratocumulus piling up over and upwind of our Catalina Mountains/Pusch Ridge. 3:19 PM. Oh, so pretty. 3:27 PM. Crazy, I know, but I thought these scenes were so pretty! 3:28 PM. As that rain band approached there were some nice lighting highlights. 3:40 PM. 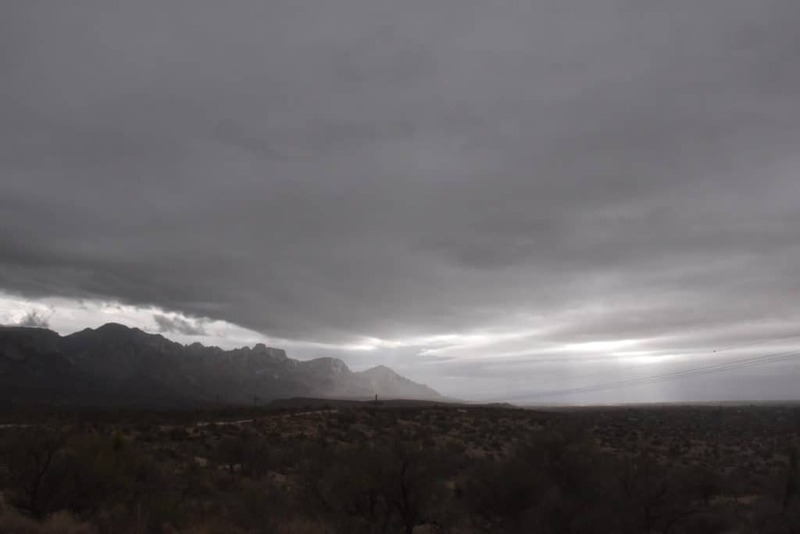 Here comes that rain band across Oro Valley/Marana. 4:19 PM. 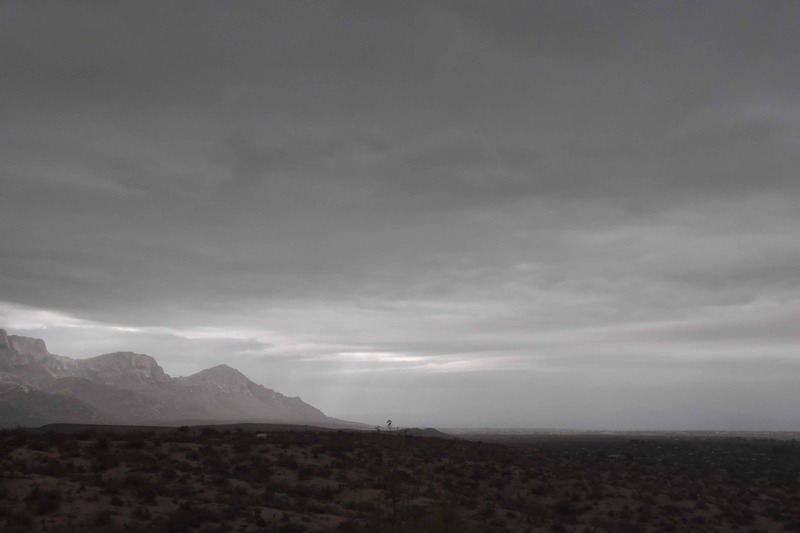 A truly great scene for a desert; mountains partially obscured in precipitation. 4:19 PM. 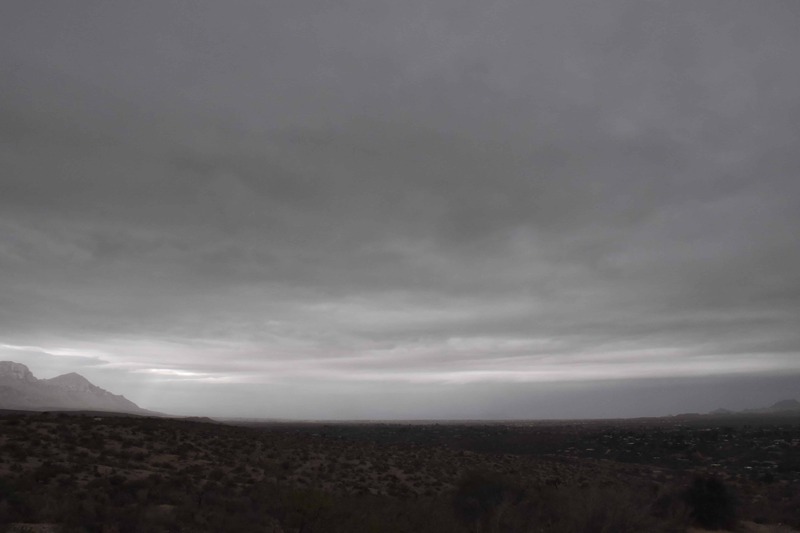 Nimbostratus. Its hard to get a better photo of rainy Nimbostratus than this. Drops coming off the roof, NOT raindrops, can also be seen. This was at the peak of the rain, too! Very exciting. 5:54 PM. Sunset Stratocumulus, hold the ice. 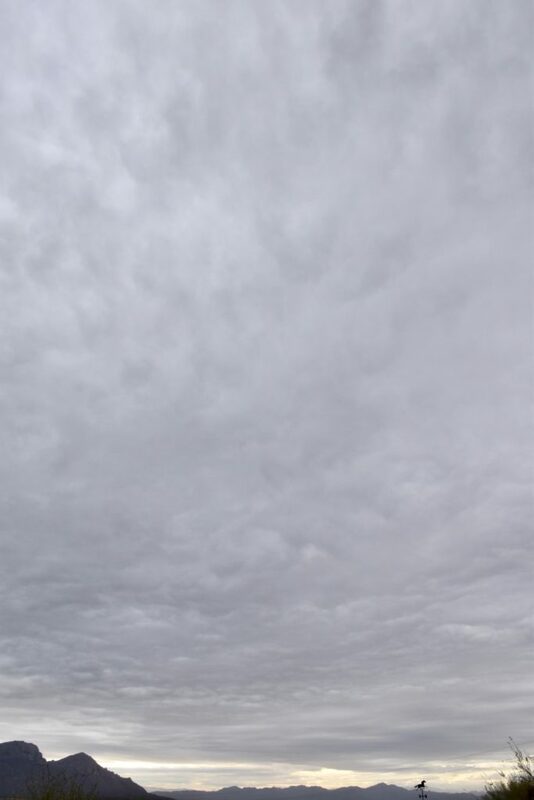 Yet, that Stratocumulus was cold, way below freezing. The title sums up where we are now. Will we go have more rain? Oh, yeah. But not right away, as you already know. I was thinking how great yesterday was for you. Started out with a spectacular sunrise (lasted just a couple of minutes), and then you could watch for pretty much the WHOLE day, orographically-formed Altocumulus opacus and castellanus transition to ice crystal clouds (in this case, Altostratus with virga and some mammatus) right before your eyes! 7:16 AM. Flecks of Altocumulus clouds below Altostratus. 12:24 PM. Altocumulus opacius shedding ice as they moved westward across Oro Valley. 3:01 PM. Altocumulus castellanus forming just upwind of the Catalinas, moving toward the west (to the left in this photo). No ice is falling out yet, though tiny ice crystals are likely starting to form. 3:01 PM. Looking farther downstream from the prior photo. Some ice is beginning to show up and fall out (center and left side of photo). 3:02 PM. Looking still farther downwind, those Altocumulus clouds are mostly glaciated, that is, mostly consist of ice. This transition has taken about 10 minutes of travel downwind. The sounding near this time, indicated that tops a little downwind of the U of AZ campus release site, were about -27°C (-17°F). However, tops were likely rising some small amount in this region downwind of the Catalinas, and so were almost surely, even a little colder than that. 4:33 PM. Nice example of what some of the Altocumulus castellanus looked like yesterday. That tallest turret will fall back. Its partner is just to the right, one that was previously as high, but fell back, its load of ice crystals drifing down. Some of the ice in the taller one is still being held up there until it, too, collapses. A error in aircraft sampling can occur if you don’t realize that tops have collapsed from lower temperatures, such as when collecting ice concentrations in the collapses one. You could easily assign a cloud top temperature that was too high; would not reflect the temperature at which they really formed. The afternoon sounding from the U of AZ campus. As here, just to reinforce that assertion a bit. Its a link to a recent blog by my cloud-obsessed friend and author, Maria Mudd Ruth. I strongly recommend buying a few of her books. Really, I do! But in viewing our deep blue skies, pocked with little fluffy Cumulus clouds over the past two or three days, you would not need convincing that even tiny clouds are beguiling, a wonderful attribute for a planet to have. Having mountains on a planet is great, too, and watching the interplay of clouds and their shadows on them is a never ending pleasure. We’re pretty lucky when you think about it to be on a planet like this one. Hope you think so, too. No rain ahead, glumly, though some sprinkles are out there this morning as frontal cloud band passes over. Just a little too high off the ground for real rain. And the cloud tops aren’t quite cold enough to form much ice, too. Those cloud tops get colder going to the NE, and so higher terrain up thataway (e.g., Show Low) are getting some light rain this morning. Right now, there’s a little sprinkle just beyond Romero Canyon, so we got a little ice this morning in them clouds. What was interesting is that I never saw no ice yesterday, to continue the slang of rock and roll, in another cheap attempt to reach out to another demographic. 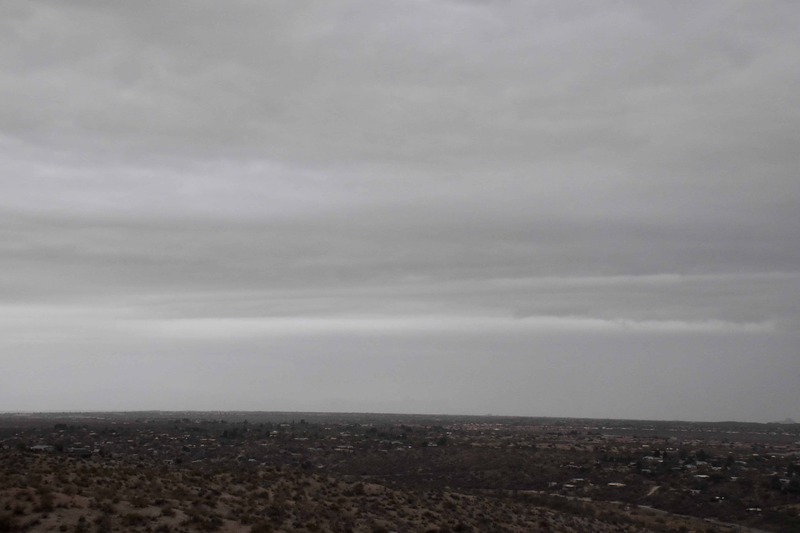 The clouds were just a bit too warm for ice-formation, tops running in the -4°C to -5°C range according to yesterday afternoon’s Banner University of Arizona’s balloon sounding. Some may have bulged up to nearly -10°C, but still not quite there. I looked constantly for signs of ice and never saw none, and neither did you, of course. The U of AZ balloon sounding for yesterday afternoon, released about 3:30 PM AST, courtesy of MeteoStar., I hope. Bases were cool, at about 4°C, at 11, 000 feet above sea level, or 8,000 feet above Catalina. Tops, about 15,000 feet above sea level. So, they were running around 3,000-4,000 feet thick with no ice. This was a situation where dropping dry ice into those clouds would have created snowfall, then sprinkles, that would not have fallen naturally. Doubtful anything would have reached the ground anywhere near our elevation, however, but up at Ms. Mt. Lemmon, something would have likely even measured from doing that far enough upwind. In summary, yes, there are some fairly rare times you can get some precip out of clouds by seeding them and yesterday was one of them1. Today the clouds are thicker, drop sizes therefore larger in those tops of a cloud band similar to the one we had yesterday evening. As drop sizes increase, the temperature at which they freeze also increases. Well, at least that’s what we found over and over again at the U of Washington. 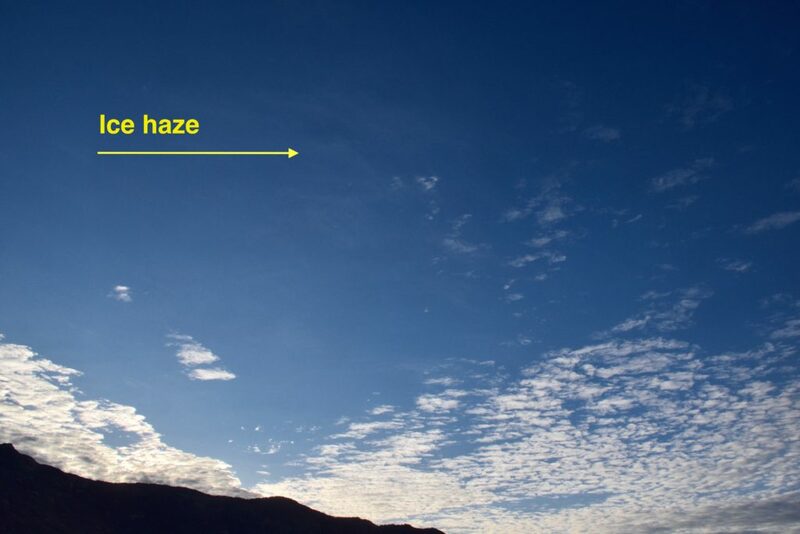 The balloon sounding launched about 3:30 AM this morning from the U of AZ. Our cloud band is almost twice as thick as it was yesterday afternoon as bases lowered and tops went up some. The sounding, too, went right up into the middle of that band, now exiting the area. The last summer Cumulonimbus harrah. Goodbye sweet summer thunderstorms. 🙁 See you next year. 10:37 AM September 19th. A field of Cumulus fractus, those shred clouds from which even might oaks can form. Not this day, though. 10:58 AM, September 19th still, way back there still. Hope you remember this scene. We now have a Cumulus mediocris. Work hard in life, try not to be “medocris” if you can. 12:44 PM. Got pretty cloudy that day for a few minutes, then cleared off. 3:10 PM. After it cleared off and the clouds went small again, we had some nice shadow effects on our mountains. Due to time constraints, we now move ahead in the action. Well, its not really “action” is it? Well, not that much, just a day ahead…. 4:48 PM, September 20th. 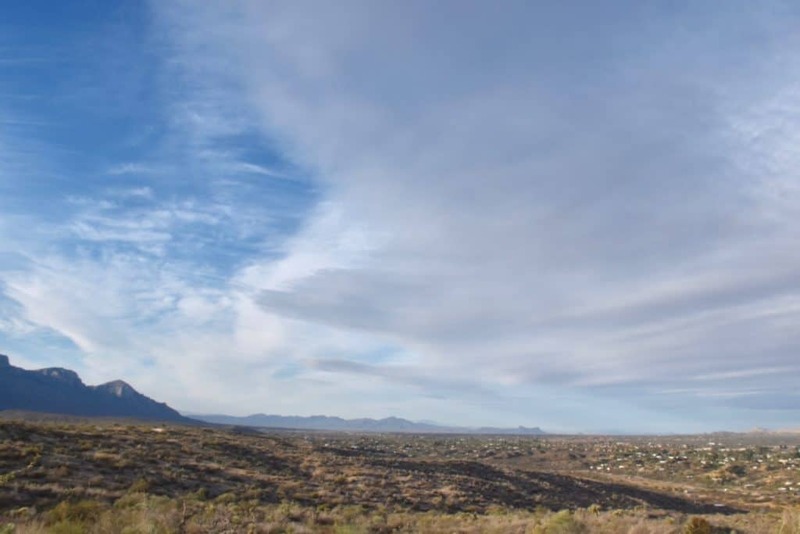 A cloud street is launched off the Tucson mountains and sails over the Oro Valley and Catalina. 4:49 PM. More dramatic shadows, ones produced by that cloud street. 6:24 PM, September 20th. The fading sun colorizes those last of the Cumulus. Moving ahead to yesterday and the day long cloud band…. 6:19 AM, yesterday. 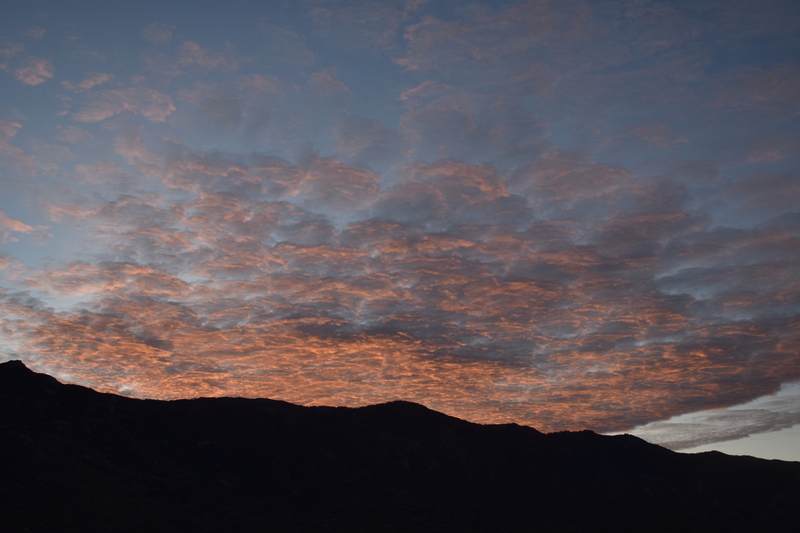 That band of Stratocumulus had sprung up overnight, providing a really pretty sunrise color. Hope you saw it. Only lasted a couple of minutes. 7:17 AM. Not much upwind at this point but wind. 12:05 PM. 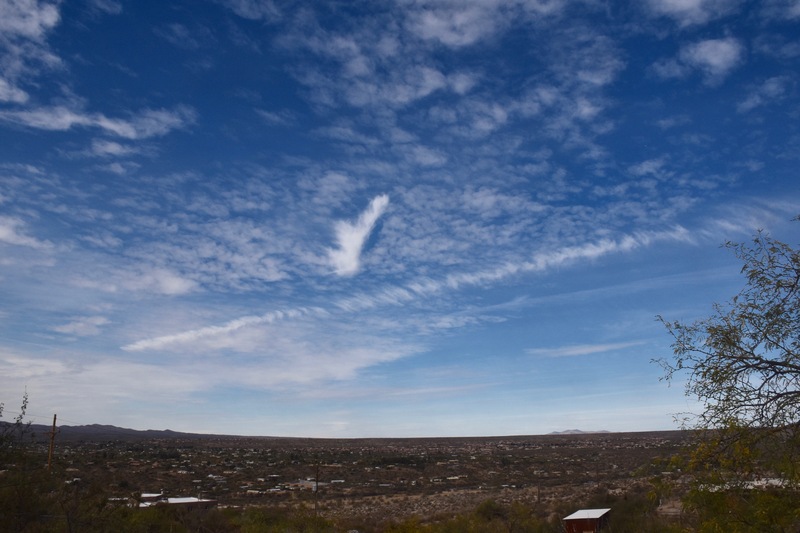 Some Altocumulus began to appear upwind of us, eventually merging in a band. 1:48 PM. Our band is really beginning to consolidate at this time (looking S on Equestrian Trail Road, aka, Lost Hubcap Trail Road). 5:10 PM. Bases had lowered to about 8,000 feet above us from the afternoon shot. Because the air way above us was cooling, the cloud began to sprout Cumulus towers. 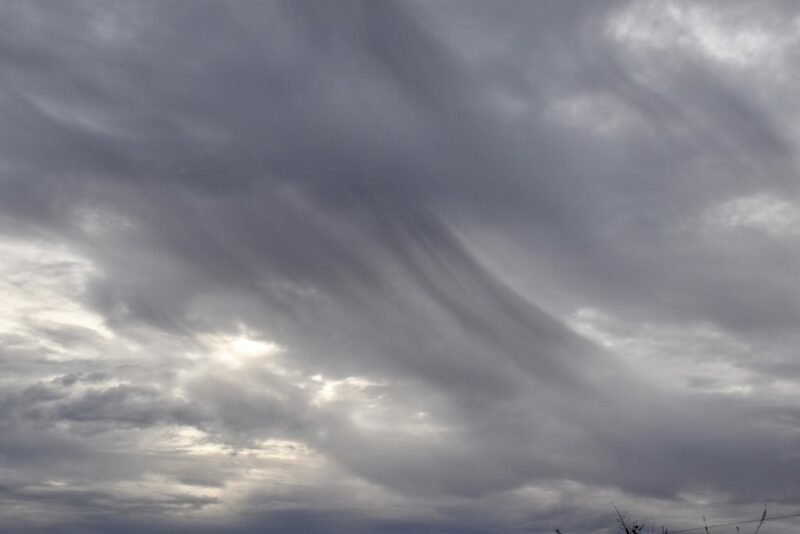 Looked for ice but none seen, so no virga around either, though it sure looked ready for that. Without ice, you’d be thinking tops must be warmer than -10°C (14°F). 5:52 PM. Our band remains in full display and will overnight. I would deem these clouds Stratocumulus, hold the ice. 6:09 PM. You can’t have a better scene than our Catalina mountains highlighted by the setting sun. We are so lucky to be here! 6:27 PM. Still going after all those hours, but not doing anything, just sitting around up there looking pretty. For the best weather discussion, see Bob M.
1Allusions to “Deteriorata” by The National Lampoon Theater. Sunset was pretty good; raindrops tomorrow morning? In nine days as well? Haven’t had much to say, brain pretty empty again after the big review of the NAS 2003 review which really needed reviewing and commenting on real bad…. Nice sunset last night; we have had a series of pretty nice ones over the past few days. April 26th. Sunrise over the Charouleau Gap. 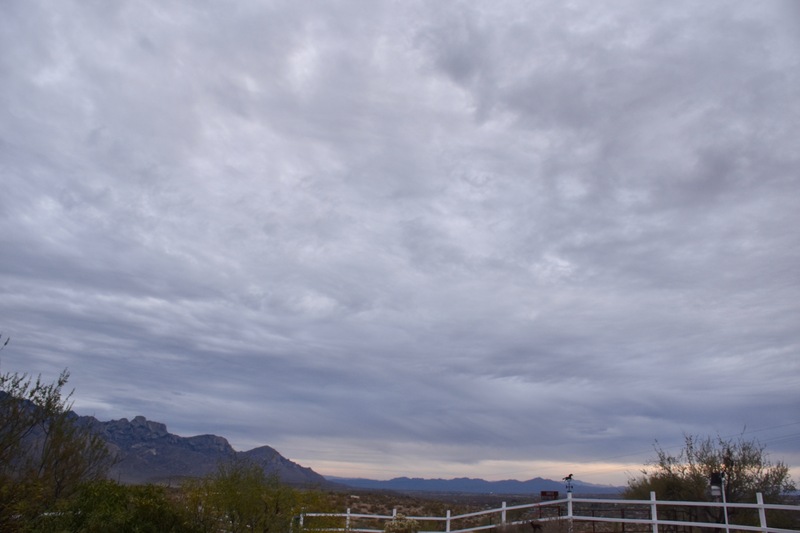 Orangy mountains highlighted by a gap in the Altostratus layer that allowed the setting sun to shine through. 7:04 PM. 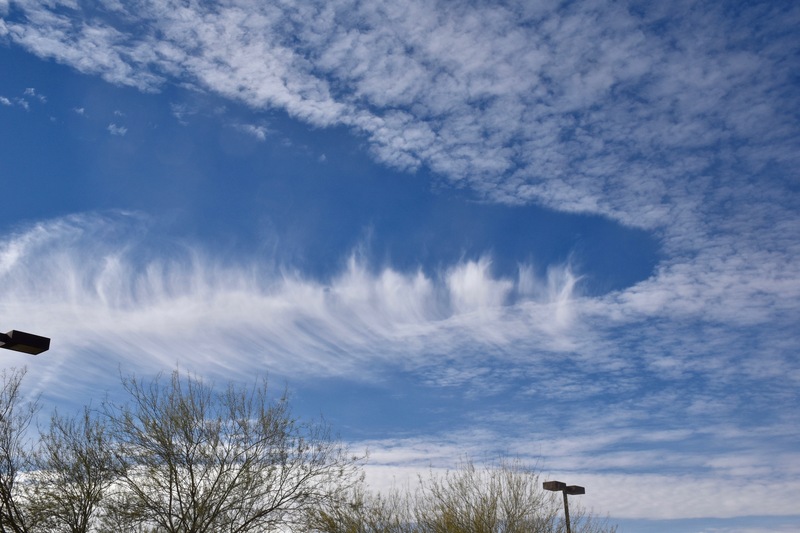 There was some turreting in this line of Altostratus that passed over, and because of those deeper tops, indicating stronger, if still slight updrafts, larger snow particles developed and produced this line of heavier virga underneath it. A contrail that’s more than about ten minutes old, now, after the new Int. 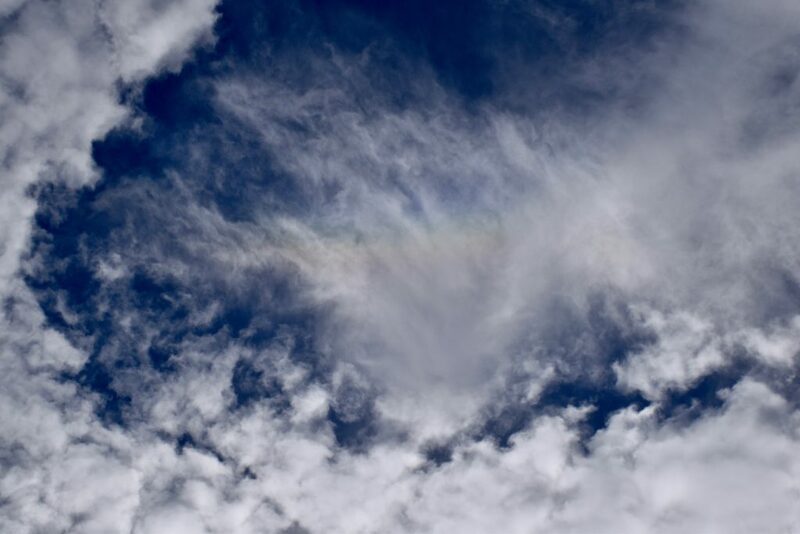 Cloud Atlas has been released, termed, Cirrus anthrogenitus, maybe castellanus in this case, too. From IPS MeteoStar, this interesting map for tomorrow morning. The orangy colors denote the strongest winds in “Jetty Jetstream”, and as you know, the colder, low clouds, ones capable of reaching the temperatures where ice forms, are contained within that ring of strongest winds at this level (500 mb). So, while the models I have looked at so far have no rain here, I think there’s a pretty good chance of a rogue shower tomorrow morning anyway. At least there should be some nice Stratocumulus/Cumulus tomorrow and some will have ice in them. As you know, it’ll be awful windy today, too, maybe 40 mph or so in brief gusts here in The Heights of Sutherland. Also will be looking for some nice lenticulars since “Jetty” will be right over us, but a little toward the warm side where lenticulars mostly occur. Map valid for tomorrow morning at 5 AM AST. Below, some spaghetti for you showing a big trough over Arizona and the Great Basin which is not much reflected in the actual models, as noted. But, just watch my friend, how those model outputs will change to reflect a bigger trough about this time! Valid at 5 PM May 7th. Not much else to talk about, no rain of course; what is that? But with so many colorful scenes yesterday, we can be partially sated by the lives we lead here sans rain here. October ended with a puny 0.01 inches in Sutherland Heights. Many departures are far over the map color-coding limit of 350%, but are over 1000% of average! Note red below normal swath. This tells you that the mean area of low pressure at the surface and aloft was just off the West Coast. Pac NW set maximum October rainfall records, too. 6:47 AM. Ac len stack. 10:51 AM. Tiny patch of Cirrocumulus tried to hide in front of some Cirrus. Hope you weren’t fooled and logged this sighting in your cloud diary. Cloud maven person almost missed it himself. 12:50 PM. 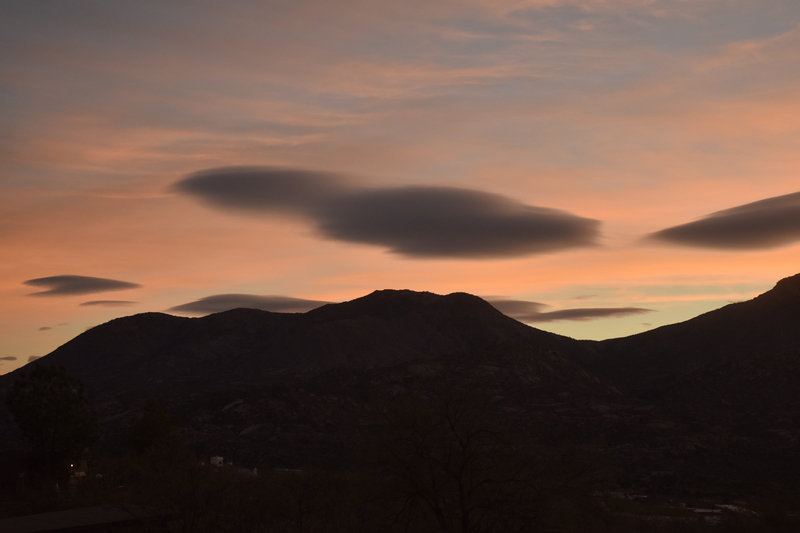 There were lenticulars aplenty yesterday. Here’s another one in a location a little different from normal, beyond the Catalinas. Upwind edge is the smoothest one at right. No ice streamers coming out the downwind end, so must have been pretty “warm”. Lenticulars, due to their tiny droplets and those droplets having short life times, have been known to resist ice formation to temperatures well below -30°C -22° F). Pretty amazing. 2:42 PM. Kind of clouded up in the afternoon, and with breezes, made it seem like something was up. It was, but far to the NW of us. We have been under a streamer of high to middle clouds originating deep in the Tropics for a couple of days. 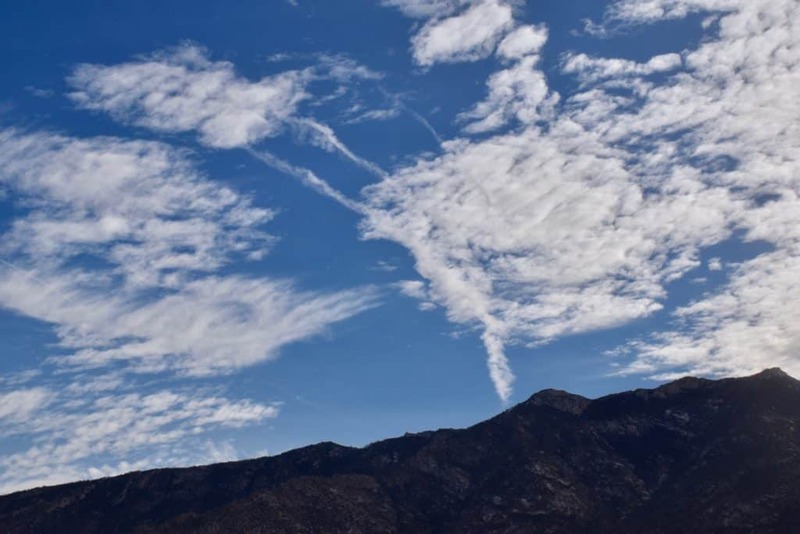 Here some lower level moisture has crept in on cat’s feet, to be poetic for a second, and has resulted in small Cumulus and Stratocumulus clouds underneath the Cirrus and lenticulars standing around. All in all, though the temperature here reached 87° F, a very pleasant day. 5:32 PM. The almost flourescent plant in the foreground is what is known as a “cholla.” The end elements fall off quite easily and attach to things like your pant leg if you brush by them on a horse, or if back into them while walking and correcting your horse for something when he’s acting a little “wild.” I can report that when seven or eight of them are stuck to the back of your shirt, its really hard to get that shirt off. In fact, it just about won’t come off without a major scream. 5:35 PM. 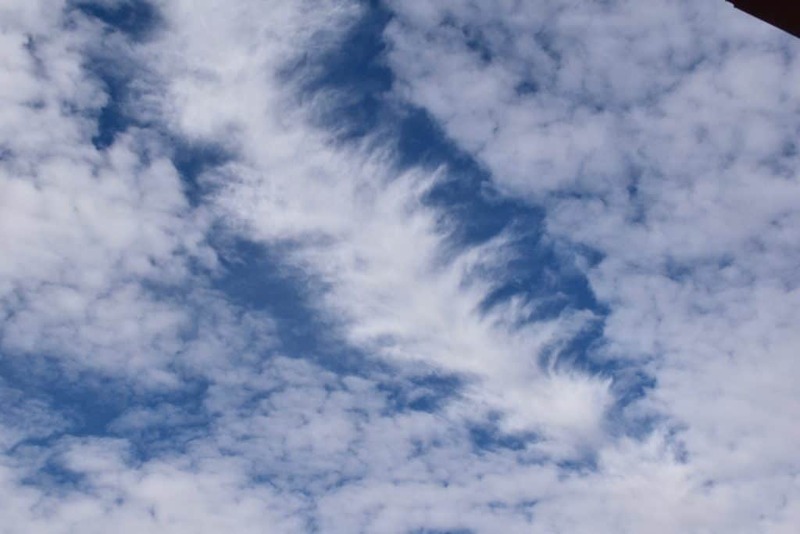 The higher Cirrus are shaded by clouds to the west, but the lower remnants of Stratocumulus/Cumulus and a few Altocumulus are highlighted as though they were meant to be for this photo. So pretty. 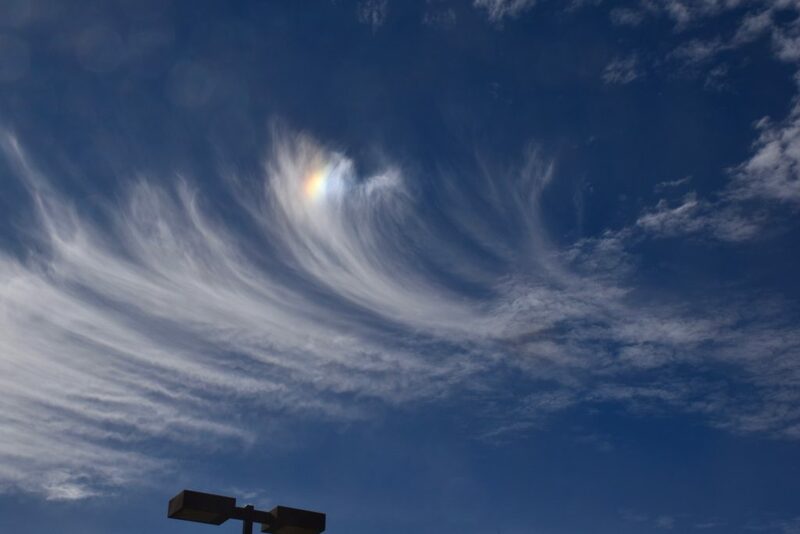 Notice, too, how there seems to be more than one layer of Cirrus. 5:44 PM. Cirrus and Altocumulus, the latter with some turreting making those the species, “castellanus”, if you care. 5:47 PM. A nice flame-out of Cirrus occurred as those pesky clouds blocking the fading sunlight from striking them opened up below the horizon. A few Altocumulus castellanus can be seen, too, but relegated to shadow status. In a further celebration of dryness here, let us examine the rainfall cumulative rainfall predictions calculated by the University of Arizona’s Dept Hydro and Atmos Sci computer the period ending at Midnight on November 5th. 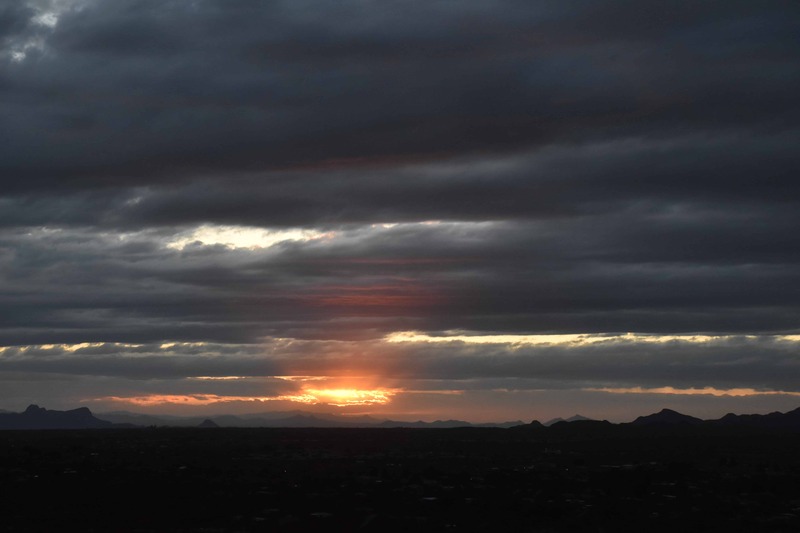 Says the coming rain in the State misses us here in SE AZ while falling just about everywhere else, of course. Dang. Let’s hope it one of the worst model predictions ever! This really poor forecast is based on the global data from last evening at 5 PM AST. 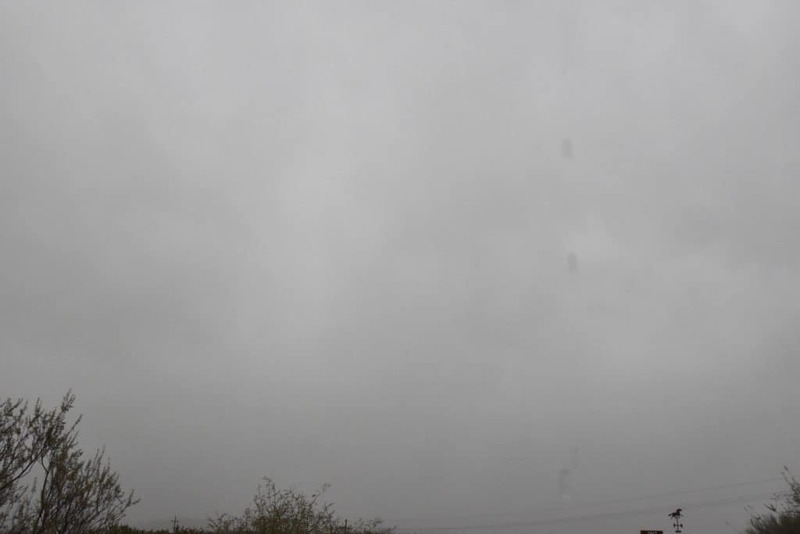 Giant clouds, dense rain shafts, frequent lightning in the area throughout the afternoon, dewpoints in the high 50s to 60 F; can it really be after the middle of October? Or, is this some kind of preview of climate change we can look forward to in the decades ahead, that is, if you’re thunderphilic? 5:05 PM. An amazing scene, and thunderstorm with such powerful updrafts that when those updrafts are blocked by the inversion at the base of the Stratosphere, they force the winds at that level to slow or backup and the anvil protrudes upwind (center left), something that is common with severe thunderstorms. This was significant here because the winds at 40,000 feet were around 50 kts, far stronger than anything we have here during a typical summer rain season. Summer Cumulonimbus cloud anvils can splash outward easily against weak winds up there in summer when they hit that barrier at the top of the tropopause. This just in from Mark A: severe thunderstorms, I have just learned here on the 20th , were observed in the PHX, and the NWS has a great link going describing all the mayhem it produced. I did not know this until just now in the middle of writing this first caption when I read Mark’s e-mail. 1:56 PM. 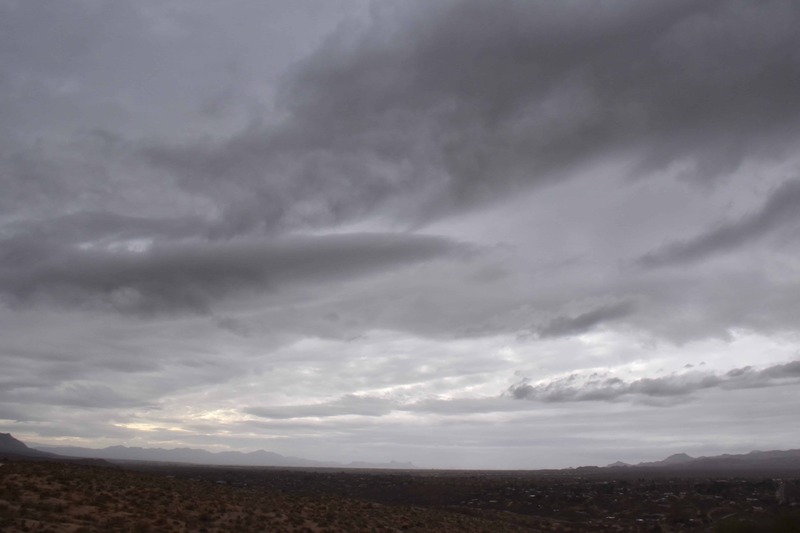 Anvil of the Cumulonimbus over west Tucson, drifts overhead of Catalina, and in three minutes, rain drops started to hit the ground. This is amazing because those drops had to fall from at around 20, 000 feet above the ground (estimated as bottom height of this thick anvil) and could only have happened if those isolated drops had been hailstones ejected out the anvil, something that also only occurs with severe storms with very strong updrafts in them. So, if you saw those few drops fall between 2 and 2:05 PM you saw something pretty special. 6:26 AM. Early portent: Cu congestus, aka, “heavy Cumulus) piling up this early. 6:29 AM. Mammatus of the morning., an extraordinary scene for mid-October, pointing to the possibility of an unusual day ahead with strong storms. as was the scientific basis for giant clouds on the 18th in the amount of CAPE predicted, over 1,000 units of Convective Available Potential Energy, later that day from computer models. That is a lot for mid-October, take my word for it. 3:45 PM. Strong storms did not form over or near the Catalinas yesterday, but they did get something. As you can see the top of this guy (Cumulonimbus calvus) is very subdued compared to the giants that formed elsewhere. 5:53 PM. Peakaboo Cumulonimbus calvus top east of Mt. Lemmon provided a nice highlight after sunset. And to have convection like this going on this late was remarkable. 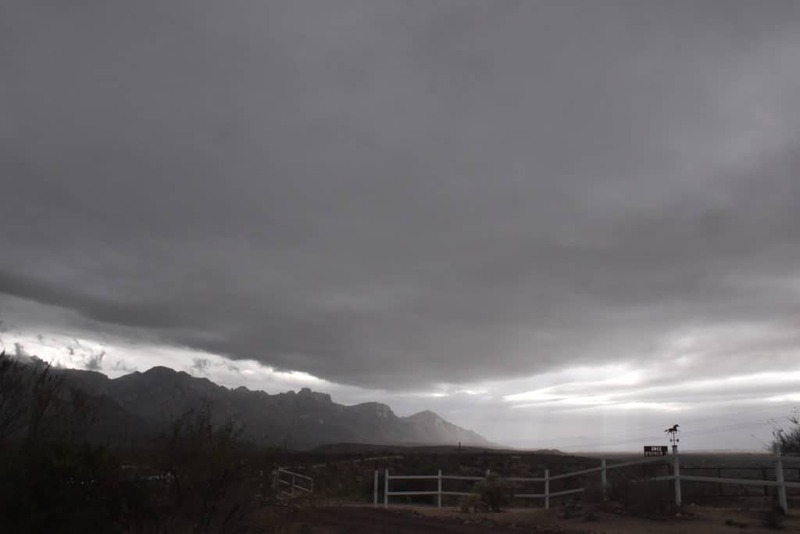 Some heavy showers and a thunderstorm formed downwind of the Catalinas about this time,, too. 5:51 PM. Pretty nice, summer-looking sunset that day, too. A nice-looking upper level trough is ejecting over us from the SW this morning but the computer model says its going to be a dry event. A second low center forms just about over us in the next day. AZ model doesn’t see much rain for us throughout these events, and rain doesn’t begin here until after dark today. I think that is WRONG; bad model. Watch for some light showers this morning, then a break and rain overnight (which the models do predict). Due this quite bad model forecast, as seen from this keyboard, I feel must interject for the blog reader I have, an improved rain prediction for Catalina over that rendered by a computer model. Feel like guesstimating a minimum of 0.25 inches between now and Thursday evening, max possible, 0.60 inches, so the median of those two, and maybe the best guestimate being the average of those two, or 0.425 inches here in Catalina. When you see a prediction of a rainfall total down to thousandths of an inch, you really know that the person predicting it knows what he is doing…..
Below, your U of AZ disappointing, but objective, take on the amount of rain based on last evening’s data and one that is the result of billions of calculations. One must remember that cloud maven person’s calculation of the rainfall amount for Catalina is only based on three. From the 5 PM AST run executed by the U of AZ Beowulf Cluster.